Nuun News and Enjoying the Snow! Hey Adventure Foot readers! I’ve got some fun news! 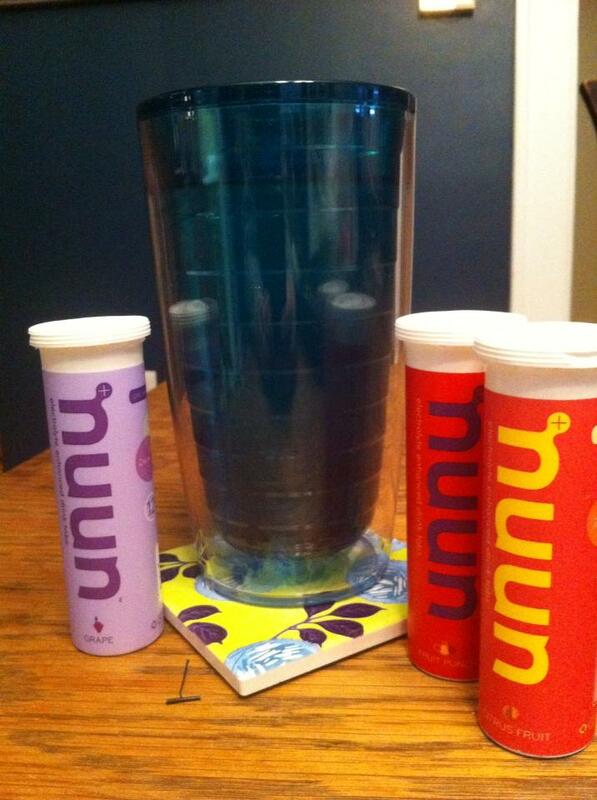 Nuun Hydration before my long run! These flavors are grape, fruit punch and tropical! Adventure Foot is now an ambassador for Nuun Hydration! I was introduced to Nuun out on RAGBRAI (Register’s Annual Bike Ride Across Iowa.) It was one of those days over 100 deg. and over 80 miles, and another rider noticed that I looked exhausted and that I’d sweat so much that there was salt dried in my jersey and my shorts. He asked me if I was staying hydrated and I replied, “Yeah, I’ve had like 8 bottles of water!” And he said, “Well you can’t just drink water! You need electrolytes too!” and he popped a Tri-Berry Nuun in my water bottle. Not much later, my headache had subsided, I felt much better, and I became a real believer in Nuun! Anyway, I’m sure I’ll tell you much more about Nuun over the next year of my ambassadorship, so stay tuned for more! I’m also planning a give-away, so now would be a good time to “like” Adventure Foot on Facebook, and while you’re at it, like Nuun Hydration too! It’s funny to have just told you about one of the hottest days I can ever remember, seeing as the last few weeks around central Illinois have been so cold and snowy! But like any good adventurer, I like to follow my foot no matter what the weather. Quincy took on a pretty deep coat of the white stuff in two big snow events in the last couple of weeks, and it seemed like it was the perfect time to try out some winter sports that we normally don’t have enough snowpack to support: snow shoeing and cross country skiing! The only problem? I don’t have gear. Luckily though, my very sweet friend from the bike club, Deb Esnault, had both and was willing to let me borrow them. Also lucky for me: we wear the same shoe size! I headed over to Wakconda, our nearest Missouri State Park. 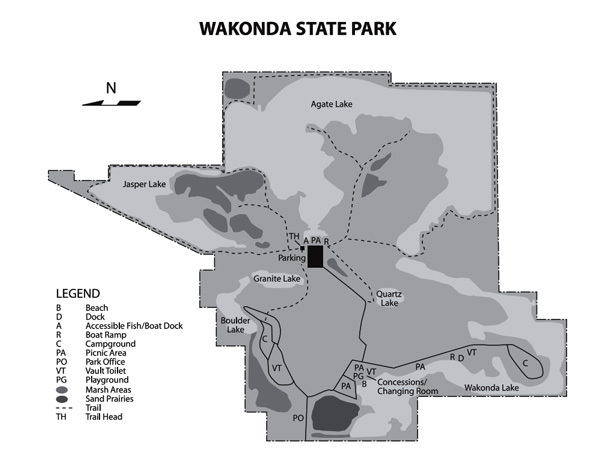 Wakonda State Park in LaGrange, MO is reclaimed land which was once a series of quarry pits. Now, the quarries are 6 deep lakes surrounded by nicely groomed hiking trails, camp grounds, and swimming beaches. 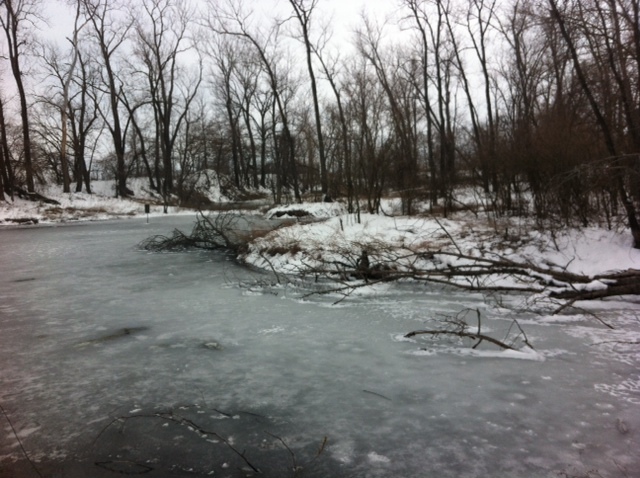 I’ve spent plenty of time hiking and kayaking there in the summer, but I’d never been over in the winter before. Adventure Foot Cross Country Skis! 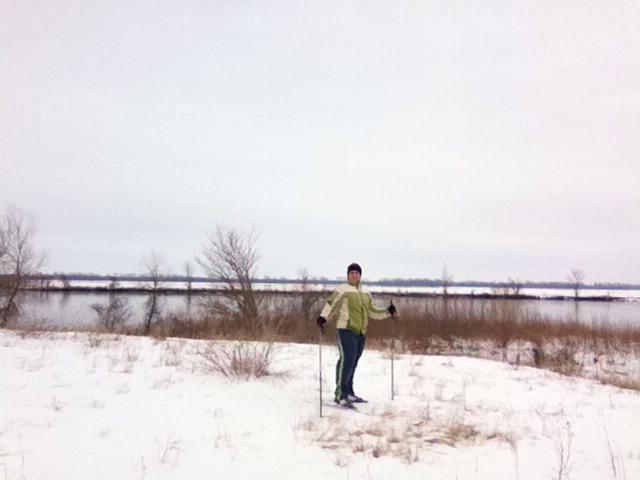 My friend Karen and I were going to cross country ski together, but our schedules didn’t work out, so my Wakonda trip turned into a solo expedition. I pulled up at the park and unloaded my gear. Save one man setting up to ice fish, I had the entire 777 acre park to myself. I decided that I was going to cross country ski the 3.5 mile trail around Agate Lake first. I’d run on that trail before, so I knew it was wide and not too hilly. Since this was the first time I’d tried cross country skiing, I spent a little time at the beginning of the trail trying out the skis and learning what they were capable of. 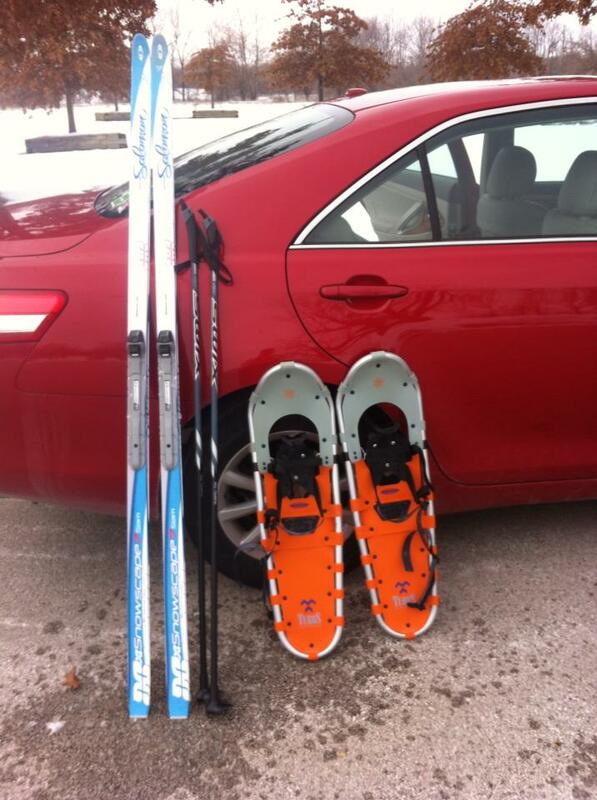 The first big difference I found between these and downhill skis is that it was surprisingly easy to move uphill. That’s primarily due to the way the boots are attached at the toe but not at the heel. The heel detachment allows for a more natural foot motion when walking uphill. The second difference I found was that though these skis were much better at making it up hill, they were much worse at making it downhill! 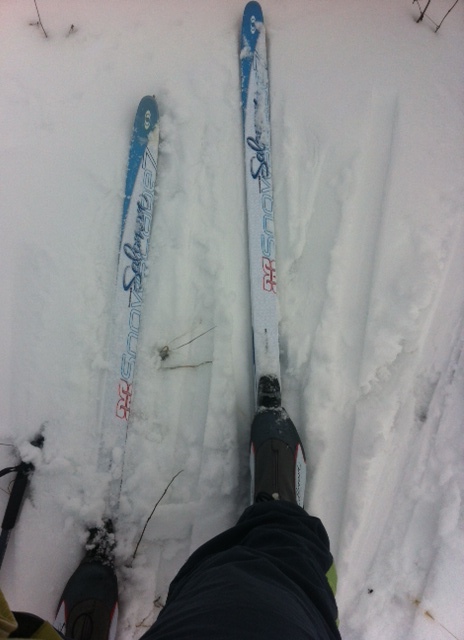 The shape makes turning the skis difficult and their textured surface doesn’t slide as well down a hill. That’s okay though, because cross country skiers are often bringing gear and things along, so controlled slow descents are probably preferable. Once I had the hang of things I set out around the lake. It wasn’t long until I’d found a good rhythm and was scooting right along the trail. The day was gray, but the trail was still very beautiful. I watched a few immature bald eagles dive in the open water at the center of the lake and the only tracks in the snow besides mine belonged to coyotes. The beautiful trail around Agate lake. I really enjoyed the rest of my time on the trail. The hills the lake offered were gentle and rolling, and just enough of a challenge to keep it interesting. 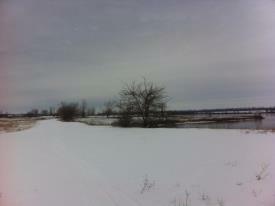 I liked how quiet the skis were on the undisturbed snow, and it was nice to have some time by myself. I was back at my car in no time at all. Showing off my Adventure Foot by the start of the Jasper Lake trail! Like I said before, we have so few opportunities to play in deep snow around here, so even though I was pretty worn out from the skis, I decided I was still going to snow shoe for a little while. I switched gear and headed off towards the smaller Jasper Lake trail. Snow shoeing was much slower going than the skis, but it had its own charms. Snow shoes have large flat bottoms called “decks” for staying on top of the snow, but also have metal cleats called “crampons” on the bottom for gaining purchase on slippery rocks or ice. The bindings fit around a regular pair of hiking or snow boots and are attached to the deck by bolts that rotate and let your feet move in a walking motion. 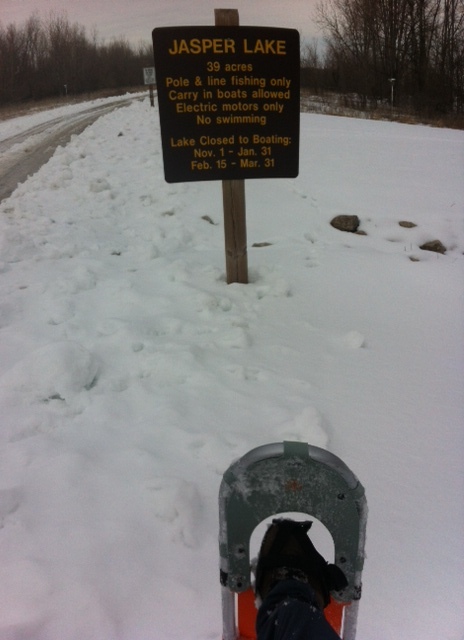 I used the snow shoes to explore the lake shore and generally poke around a little. The park looks so much different in the winter and a little sunlight showing through the clouds added a lovely sparkle to the snow. The snow shoes were fun to try and really did save energy when compared to just trudging through deep snow. 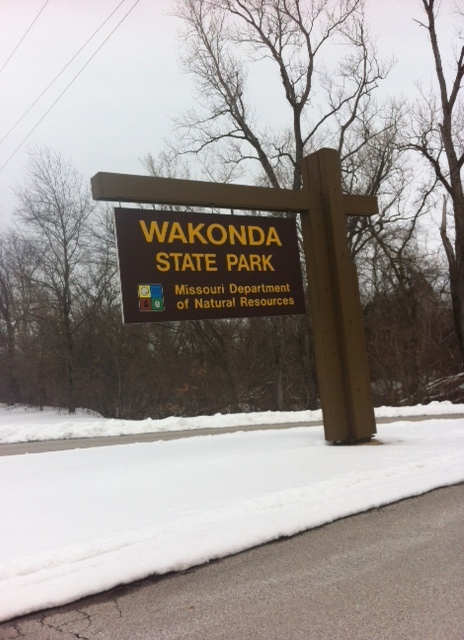 I really enjoyed my solo trip to Wakonda and am looking forward to visiting this nearby park for more adventures, no matter what the weather. I hope you find ways to follow your Adventure Foot this spring! There’s so much to explore!